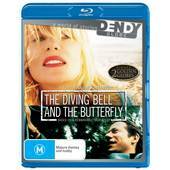 The Diving Bell and The Butterfly is a 2007 French/American film based on the memoirs of the same name from Jean-Dominique Bauby (Mathieu Amalric), who at the age of 42 suffered a stroke which sent him into a coma and when he awoke, is found that he has an extremely rare condition called “locked-in syndrome”, which is the patient being mentally normal, but the body almost completely paralysed. Unable to move from the neck down or speak and having his right eye sewn shut as it no longer irrigates properly because Doctors fear an infection, Bauby is left only able to communicate with others using a system created by his speech and language therapist by blinking his left eye while letters of the alphabet are recited to him. Bauby uses this system to write his memoir in which he goes on to explain his life before, the regrets of his life and living with the affliction that has a normal man trapped inside his own body. I found myself very drawn into the film, with it’s uncommon subject matter, it’s made a very interesting and powerful film that shows the inner struggle of a man who had a very exotic, high profile life, but is now literally trapped inside his own body, which in turn has relegated him to a life in the Naval hospital which he is being treated, that has now become his home. Mathieu Amalric shines as Jean-Do, portraying the life before his stroke and the life after, confined to his wheelchair, letting us into to his mind and thoughts through narration. Even in his trapped body, he still realises that he has his vast imagination and with it, he can go and be anywhere he likes at anytime and it’s this inner strength that makes the character so compelling and so very endearing to watch. The Blu-ray transfer looks beautifully realised in numerous places, with seeing life through Jean-Do’s ‘eye’, with the often hard to make out and unfocused imagery of a man who’s been through a major trauma, but the transfer is still a little rough around the edges, which add to the feeling that we are trapped inside Jean-Do with him, seeing the world the way he now sees it. I was also surprised to learn that the film was originally meant to be filmed in English with Johnny Depp in the role of Jean-Do, though Depp had to drop out due to scheduling conflicts with Pirates of the Caribbean: At World’s End. I wonder how that film would have ended up? No doubt Depp with an Oscar nod and possible even a win. Who knows. But this film, the film that was made is a beautiful, compelling, moving and inspiring. A look into the life of a man who was struck down with what I can only imagine is the worst kind of affliction. A great film that is definitely well worth seeing.